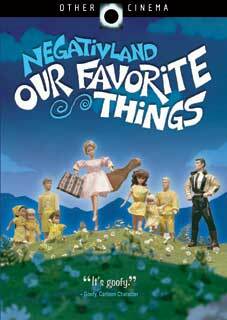 othercinemaDVD.com -- Negativland's "Our Favorite Things"
Our Favorite Things is a new DVD/CD release from reigning Kulture Kut-up Kings Negativland. Twenty-seven years of the group's "greatest hits" have become all-new moving pictures in this amazing, years-in-the-making package. Created with 18 other filmmakers from all over the USA (and one a capella group from Detroit), Our Favorite Things is a collaborative project that takes Negativland's sound explorations into the world of film and video. What emerges is a darkly cracked look at 21st century America, juxtaposing paranoia, torture, control, power, weapons, fear, suicide, cola wars, mental illness, and intellectual property issues with the lighter side of dopey advertising, cartoon characters, cleaning products and Jesus. The Our Favorite Things DVD includes over 60 minutes of never-before-seen bonus material, and, for those who would rather shut their eyes tight and just listen, it also comes with a full-length CD which isn't by Negativland at all: "180 D'Gs TO THE FUTURE!" by the Gospel R & B Doo-Wop group, The 180-Gs. You'll be all ears as this talented posse from inner Detroit sings out heavenly cover versions of Negativland's best (and least) known cut-up collage work from throughout their career, making for one of the strangest recordings you have ever heard. • "I Still Haven't Found What I'm Looking For"
• "Yellow, Black And Rectangular"
• "Aluminum or Glass" • "Favorite Things"
• "Why Is This Commercial?" The Long Lost "Visit Howland Island"
Jon Behren's "Anomalies Of The Unconscious"